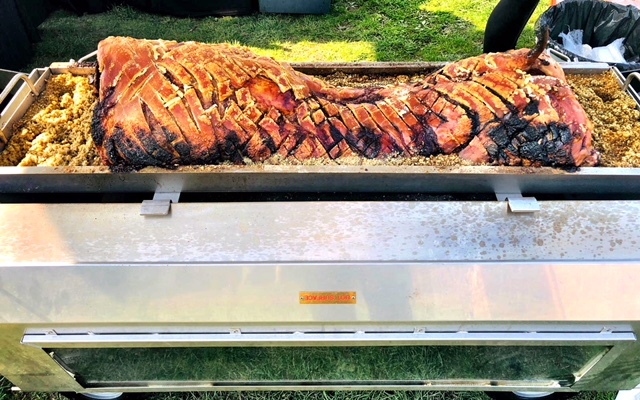 Back at the beginning of the year we received a call from a lovely man named Daniel, now Daniel wanted to make a booking for his father’s 70th birthday (and how flattered we were at Hog Roast Carluke to be considered) and of course, we absolutely had to accept! When we arrived Daniel himself seemed thrilled as he had researched us quite a bit online and even studied our google reviews to single us out. He told our staff just how special his father, George, was in the area as he had lived his entire life in Carluke itself and had achieved celebrity status within that local area and so we were, of course, very humbled to be the choice for such a fine and well-respected gent’s occasion! Now like all good stories we did encounter a problem in the sense that neither ourselves nor Daniel himself realised just quite how many people wanted to come and give their best to George on his big day and it was because of this that we were admittedly, for a brief moment, worried we wouldn’t have enough to feed everyone, however after explaining to Daniel that we had no intention to let his father down on his birthday our staff worked tirelessly utilizing our very own Titan machine to ensure that no one at the party went hungry – and fear not for our staffs efforts were rewarded with a personal and rather touching thank you from George himself, who we now consider a good friend of ours after he was kind enough to treat the Hog Roast Carluke staff’s hard work with a delicious slice of his very own birthday cake – what a man! What a great afternoon/evening it was for everyone, including ourselves from Hog Roast Carluke, and we did have time to enjoy a lovely talk with a very grateful Daniel who actually stressed that he fully intended to see us again at his own birthday celebration which we are, of course, very much looking forward to! He even expressed interest in potentially pursuing his own interest in hog roasting which we then had a great in-depth discussion about regarding what it is we do and the range of products we have available especially for aspiring hog roasters and we have no doubt that one day very soon Daniel’s very own hog roast will be the talk of the town!